An open question that needs to be assessed can be found in activities of the types Lesson, Assignment and Assessment. 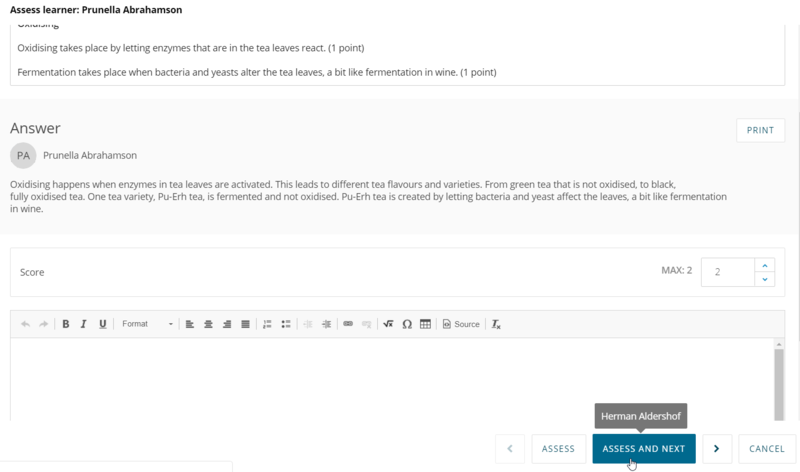 You can use the model answer to assess whether the answer is correct and fill in a score. Learners can upload a file that needs to be checked and assessed. Will give learners a score for an event that they have attended. This activity has been completed separate from aNewSpring. This could be a practical exam or an external course that is displayed through LTI. You can give the learner a grade for this activity afterwards. Give learners a grade for the webinar that they attended through aNewSpring. These are self assessments where learners first answer the list of questions for themselves, after that they will invite (external) assessors to fill in the same questions. Afterwards, learners can view the combined results to get a better view of themselves and their progress. Go to the Instruct tab and click the Assess icon: . If there is a number, this indicates the amount of new assignments that need to be assessed. You will only see the graduation cap icon if the designer chose the template type Blended, Social or Game-based Learning. Click the Learners tab to assess all handed in activities of a specific learner. Or go to the Activities tab to assess per activity. You can assess the activity by filling in a score, scrolling with your mouse, pressing the arrow buttons on your keyboard or using the arrow buttons in the screen. For a hand-in assignment it could also be the case that you can only choose between 'passed' and 'failed'. If you choose 'failed', you can indicatie if the learner can try again or not. Click Assess and next to continue and assess the next learner. If you reassess an activity, the date of the first time it was assessed will remain visible to the learners. If you assess 'Learners' at step 1, you can assess the answers of all learners for the same activity one by one. If you can't reassess the activity, this is because the designer did not enable this option in the template. The designer can still change this setting. The administrator can set up an event to be assessed by an instructor. These can be done under the Events tab under the Instruct tab. If you click the graduation cap, you will find the list of learners and you can click Assess to give them a score.